July in Mississippi the gardens are full of fresh summer vegetables and one of the favorite dishes is succotash. 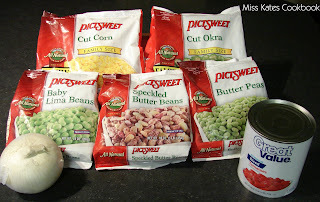 Succotash is a combination of okra, corn, baby lima and speckled butter beans, and butter peas, with tomatoes and onions. I remember sitting at the table with my Grandmother and Lily our cook with large bowls shucking lima, butter, and sweet beans. I thought the bowls would never fill up but I loved sitting there talking and listening to the day’s events. 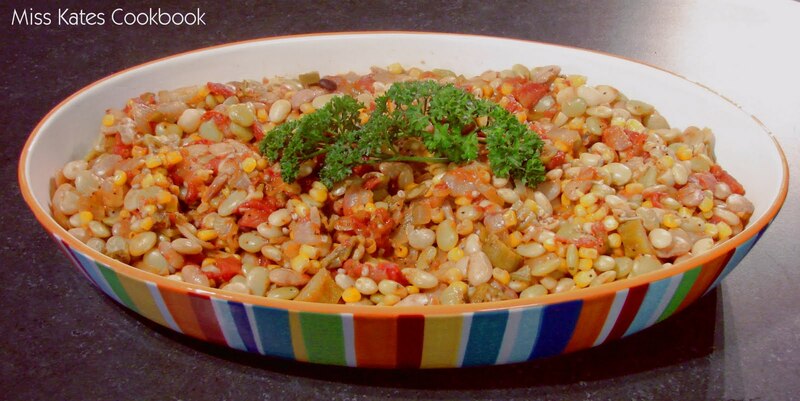 I hope you enjoy this dish as much as I do. Now if you live in the southern, eastern parts of America you can get all of these vegetables fresh from your farmers market. Here in northwest you will have to use frozen vegetables, which are just fine. Walmart has all of these in the frozen food aisle. Heat oil and bacon in a heavy pot. Add onion and cook till onion start to brown, then add garlic. Cook for about 3 minutes, then add tomatoes cook for about 5 minutes. Now stir in add all the spices then add all the other ingredieants and cook for 20 to 30 minutes over medium heat. Lower heat when succotach starts to boil. Bon Appetit !